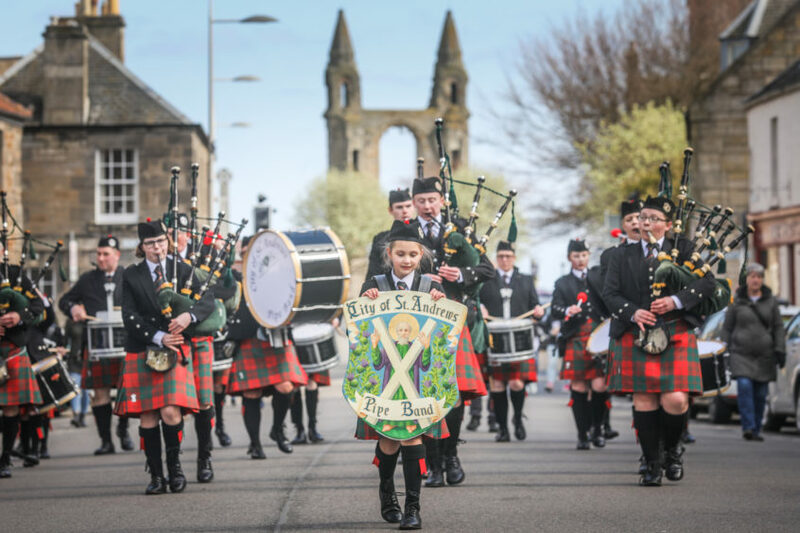 The parade, held under blue skies, saw Andrews University students and staff dress up as around 140 characters from the history of the town and Scotland. Riding in a daffodil-festooned carriage was the central character, Lady Katharine Kennedy, the widely adored niece of St Salvator’s College founder Bishop Kennedy. Students and the local community come together to enjoy what is a special day for town and gown alike. Led by a barefoot St Andrew, characters ranging from bishops, queens and kings to golfers greeted the crowds. Visitors saw a jester running around, while the bishop blessed them in Latin and shield bearers handed out daffodils. However, most come to see the leading lady, Kate Kennedy, who as tradition dictates, is played by the most promising first-year member of the Kate Kennedy Club. This year the honour went to Sam Saunders, a history student at the university. Last year’s Kate, Ed Wootton, again as tradition demands, was the marshal of this year’s event. It is down to members of the Kate Kennedy Club and the Kate Kennedy Trust to safeguard the event. While tradition was followed, this year Kate did manage to enjoy a new costume for 2019. As the Kate Kennedy Club looks to reinvigorate the procession each year, in addition to that, this year’s procession also had new additions, Marie De Guise, Queen of James V, and Bishop Robert, who laid out the town.